What if we want to travel or work abroad after graduation? What if we want to make going international a life option? As in so many things, the first step is the hardest. How does one travel as a recent graduate facing monthly loan payments approaching or exceeding a thousand dollars? If we can’t work in certain privileged sectors are we condemned to face grinding wage slavery with little prospect of travel and adventure? This is precisely the moment of our lives when we want travel and adventure the most! And isn’t this time in our lives when we can most benefit from international experience? The immediate years after university graduation have always been some of life’s most challenging. For today’s graduates prospects are tightening further. In America a particular challenge is student loan debt, which has cumulatively grown more than 150% in the last decade. With big monthly payments, deferments just a stop-gap, and soaring living costs in America, it’s hard to pay our student loans when were among the majority of U.S. graduates not lucky enough to land jobs in a few specific high-paying sectors. And what about women travelers? There are a whole set of extra concerns. 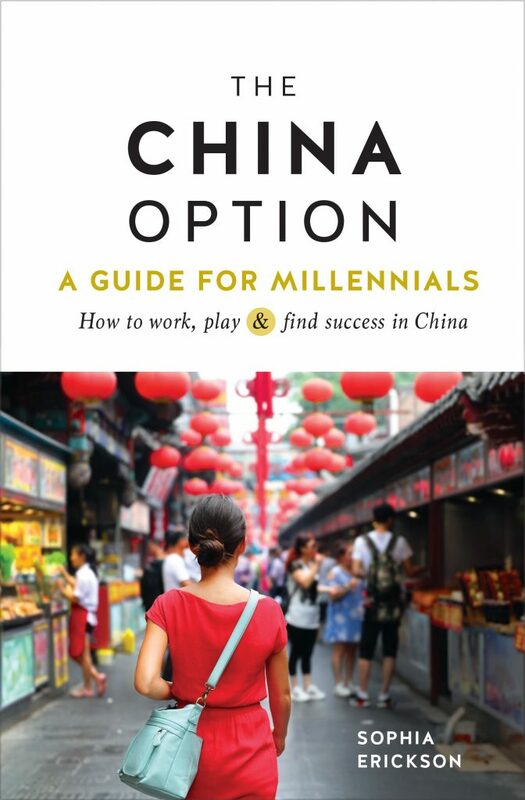 In The China Option — A Guide for Millennials, Sophia Erickson offers an unusual and exciting strategy for people struggling to make student loan payments: moving to China to work in that country’s booming English-language education sector. Sophia doesn’t believe the China option is for everybody. But she offers perspective to help readers make this decision in light of their own circumstances. Step by step, Sophia looks at moving to and working in China for people just like her: humanities graduates who want to travel and see the world while staying on top of their student debts. How about native English-speaking graduates from the United Kingdom, Canada, Australia, Africa, India, and New Zealand? Is the China option equally valid for them? Sophia discusses the pros and cons. She doesn’t hesitate to discuss sensitive issues like racism, sexism, and LGBT issues. She doesn’t sugarcoat the challenges but neither does she overestimate them; she identifies and offers strategies to address them. Sophia knows the path because she’s taken it recently. In 2014 she graduated with a degree in modern history facing the same challenge her readers face today: limited career options, significant financial obligations in the form of student debt, and no desire to immediately jump into the sorts of high intensity jobs in consulting, the law, or finance that many of her peers sought upon graduation. But she didn’t want to wait tables in her hometown either. Sophia moved to China. There she paid off nearly half her student loans while abroad, even while visiting China from Heilongjiang to Hainan, as well as Myanmar, Vietnam, Malaysia, and Singapore. Every experience is different; of course we’re all unique. But Sophia sketches out a path that includes deciding whether teaching English in China is right for her readers, showing them how to find their first jobs, and explaining how to make the transition to China as painless and as fun as possible. She also addresses the issues millennials want addressed before they get on the plane: how to find an apartment, how to avoid getting scammed, how to keep safe, how to approach learning Mandarin, and even what’s it like to date in China. She elaborates on a wide range of topics from the concept of “face” to coffee culture to racism to Chinese attitudes towards religion to love and to LGBT issues.